Nigerian Biography: Biography Of Dave Umahi; Governor; Politician; Ebonyi State Celebrity. Biography Of Dave Umahi; Governor; Politician; Ebonyi State Celebrity. community in Ohaozara Local Government Area of Ebonyi State. He was born on January 1, 1964. Dave Umahi attended Umunaga Primary School, Uburu between 1971 and 1977 and obtained his First Leaving School Certificate with Distinction. He attended Ishiagu High School between 1978 and 1979, and then moved to prestigious Government Secondary School Afikpo, where he completed his Secondary Education. After his secondary school, Dave got admission into Enugu State University of Science and Technology where he obtained a Bachelor of Science Degree in Civil Engineering from 1982 to 1987. After his University education, Engr. Dave Umahi, underwent the compulsory one year National Youth Service (NYSC) scheme between 1988 and 1989, which he did at SAIPEM SPA in Benin City, Edo State. After his National Youth Youth Service program, Engr. Dave Umahi started a career with SCC Nig. Ltd, an Israeli Water Engineering Company. There, he became a Project Engineer. He later joined NORMAN ENGINEERING AND CONSTUCTION NIG. LIMITED a company he co-founded with the then Managing Director of NAFCON, Dr. Ombo Isokarari. He also worked with and/or founded other reputable companies such as: (a). Brass Engineering & Construction Nig Ltd. (b). Fucus Investment Nig. Ltd. (c). Osborn La Palm Royal Resort Ltd.
Dave joined politics and became the Acting chairman of Ebonyi State chapter of the Peoples Democratic Party (PDP) between 2007 and 2009. He was later elected the substantive State chairman of PDP in the year 2009, a position he held till 2011. Between the years 2010 and 2011, he served as the chairman, Governing Board of the Federal Medical Centre, Asaba. In the year 2011, Dave teamed-up with Chief Martin Martin Elechi, as running mate, and they contested for the position of the governor of Ebonyi State. 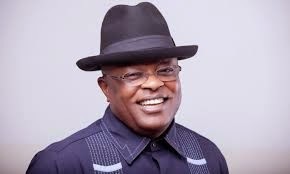 Dave Umahi became the Deputy Governor of Ebonyi State following their success in the gubernatorial election of Ebonyi State and was sworn in on 29th May 2011 for a term of four years ending in 2015. On April 11, 2015, Engr. Dave Umahi contested for and won election as the governor of Ebonyi State. Chief Dave Umahi is married to Rachel Umahi and they have seven children..